Famous for its sizeable populations of elephants and large carnivores, Hwange National Park in Zimbabwe is also home to one of the most elusive predators on the continent: the endangered African wild dog. 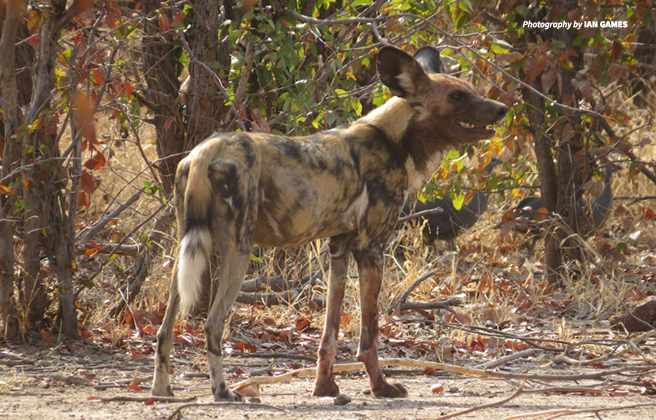 About 150 wild dogs—also known as “painted dogs” for their colorful, patchy coats—live in Hwange and its environs. As more people settle around Hwange, the African wild dog population faces increasing pressure in the form of habitat fragmentation and human–wildlife conflict. The most pressing threat to the wild dogs’ survival, however, is poaching. With limited employment opportunities and sporadic rainfall that negatively impacts farming yields, bush meat hunting has gained popularity over the past several years as a means to make a living. Poachers commonly use wire snares, which kill large animals indiscriminately. Wild dogs are particularly vulnerable to injury or death by snares because they cover a lot of ground while hunting. (Wild dogs travel more than 12 miles per day on average.) In addition to snares, poachers sometimes poison water sources with cyanide. They are normally targeting elephants for their ivory but kill a variety of other species in the process. Stemming the tide of poaching within Hwange National Park has proven challenging for the resource-strapped Zimbabwe Parks and Wildlife Management Authority—not to mention the fact that protecting the park itself is not sufficient. Wild dogs and other species frequently travel beyond the park’s borders into its buffer zones, where the risk of encountering poachers and snares is higher. These intensified efforts have achieved impressive results since AWF began providing support in 2014. The anti-poaching unit, comprising PDC rangers and local volunteers, has increased its patrols in the buffer zones surrounding the national park. On average, patrols remove more than 100 snares per month while apprehending poachers and destroying poaching camps. Rangers also detect and dispose of cyanide while on patrol, preventing the deaths of any animals that would have quenched their thirst with contaminated water. In the nine-month period from April through December 2016, patrol efforts led to the arrests of eight poachers. In areas with regular ground patrol presence, there has already been a reduction in poaching activity. Local communities’ attitudes toward wild dogs, meanwhile, are becoming more positive. The wild dog population in the Hwange landscape is stable—a testament to the success of these efforts. The hotline for reporting poaching has even helped species other than wild dogs: People sometimes call to tip off the authorities about planned elephant poaching activities. African wild dogs can roam safely throughout Hwange National Park and its once-risky buffer zones.